Franz Joseph Haydn: Symphony #104 in D Major "London"
Wolfgang Mozart: Symphony #35 in D Major "Haffner"
Franz Schubert: Symphony #4 in C minor "Tragic"
Despite a long and wide-ranging career, today Sir Adrian Boult is remembered primarily for the recordings he made for EMI between 1966 and his retirement in 1981. This period was dominated by the music of Vaughan Williams and Elgar, composers for whom Boult had a particular sympathy. As a result, Boult has been pigeon-holed as a conductor of English music, when in fact he was capable of so much more, as this ReDiscovery collection demonstrates. These recordings were made in the 1950s (and possibly the early 1960s) for the Concert Hall label and World Record Club, both mail-older operations. ReDiscovery's David Gideon has remastered them from original LP sources, and while the sound isn't particularly outstanding for the period, it nevertheless remains honest and likeable. The word "valedictory" sometimes is applied to Boult's later EMI records – a euphemism, one guesses, for "slow." Earlier in his career, however, he could be very dynamic, and there is plenty of evidence for that here. His big-boned Haydn, Mozart, and Schubert have an appealing rough-and-tumble quality: the game here is more akin to rugby than badminton. In these works, we hear Boult's skill in sculpting symphonic movements through gradated climaxes. By today's standards, this isn't always stylish playing – it can be a little aggressive (and the London Philharmonic can be rough-toned) – but it's never self-indulgent. With Boult, you feel like you're in good hands. The Smetana sounds more international than Czech, though. The concertos are doubly interesting because they preserve the work of largely forgotten violinists. Maureen Smith's Mendelssohn is sometimes gluey, with overdone portamenti, but she clearly is in sympathy with the score, and much of her playing is beautiful. According to ReDiscovery's annotations, she was made a Professor at the Royal College of Music in 1998. South African violinist Hyman Bress, who ended his career in the 1980s due to mental illness, is a more idiosyncratic and unpredictable soloist in the Tchaikovsky, playing loose with tempo and tone. It's anything but a cookie-cutter reading, and it was one of the first to omit the traditional Auer cuts. In both concertos, Boult and the London Symphony are both supportive and imaginative, although one feels that Bress is pushing Boult around in the Tchaikovsky. This pair of CD-Rs is available from www.rediscovery.us for $25, which includes shipping (which, in my experience, is always very prompt). 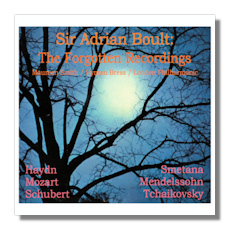 This release is well worth considering for those who like Boult's later recordings, and who want to know of what else the conductor was capable.